Today, L choked on some orange at the table. I honestly don’t completely know exactly what happened, even though I was sitting right next to her. I noticed her start kicking her legs, she was making a sound every few seconds, so I don’t know if she was choking and then managed to breathe again or what, but her lips were purple Absolutely terrifying. Coincidentally, while she was choking, our neighbors stopped by with a welcome basket. Now, I almost never ever yell or shout. But seeing L’s lips purple scared me and I was yelling at her and at H. Not a good moment. We obviously ignored the bell, but they hung around, and I eventually got the door. They probably heard me yelling and think I’m some angry abusive mother / wife. Lovely. We have had three scary moments with L. This was the third. The second was during her apparent reaction to the MMR vaccine when I took her temperature, and it was 103.7 twenty minutes after giving Tylenol. She was burning up. Ug. That was also a very bad moment. The first was when we weighed her at her two-week appointment and discovered she was more than half a pound below her birth weight. 6.5 pounds is just not much. I was so afraid for my little baby. I love the newborn period, but it’s also just so reassuring when they put a little weight on. Honestly, if I could change one thing about my children, I would have them be fatter babies. B’s weight gain is just not fast enough for my taste. This entry was posted in Briony, Isla, Motherhood on November 30, 2014 by admin. 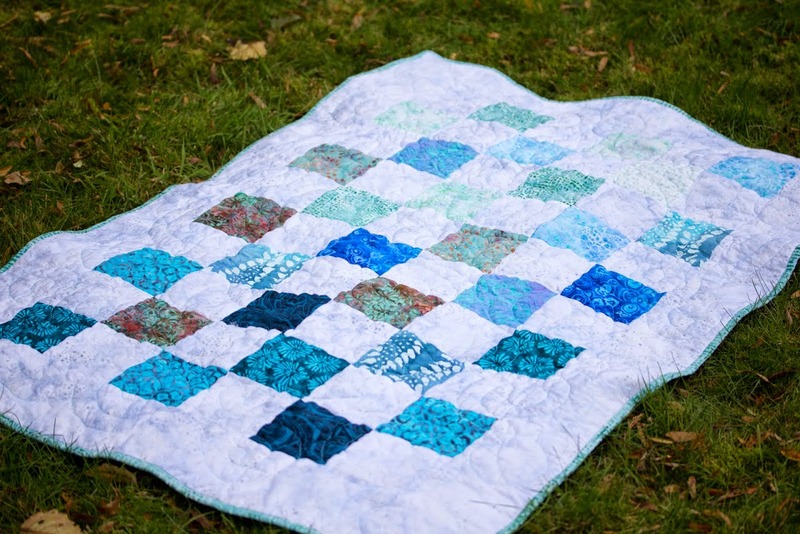 Quilt number three is a present for a friend having a baby boy this December in Texas. I followed this pattern (blog), which was very well written and easy to follow and also free. 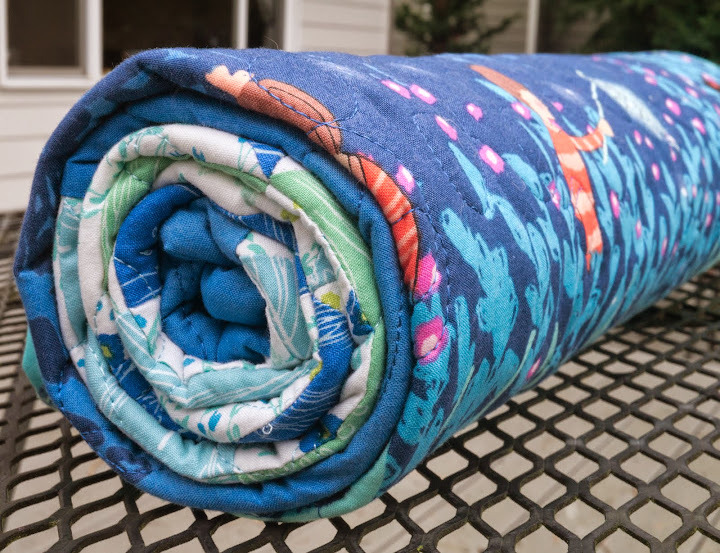 I made the quilt exactly as described in the pattern, except I used the blue fabric line rather than the pink. Both are very nice, but I think I actually prefer the blue, regardless of gender. But then, blue and green are my favorite colors. 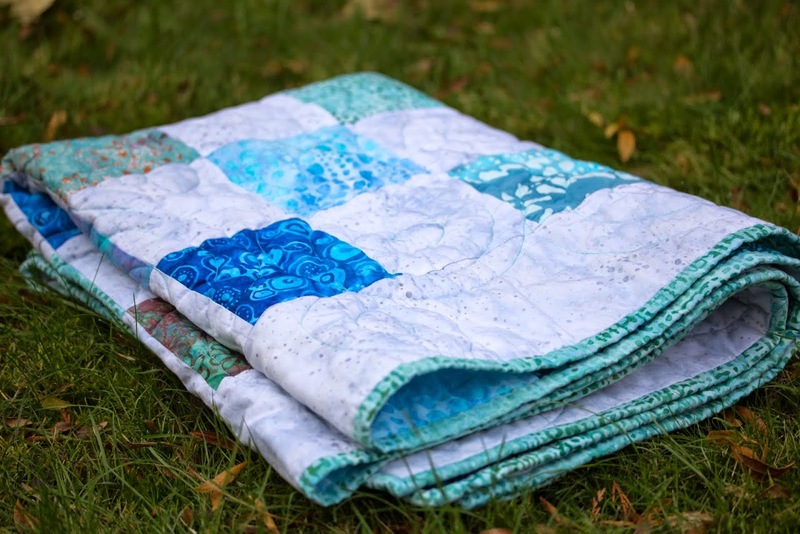 Binding: Radiant Threads 40 in light blue. Double fold binding hand stitched to the back. Cut from selvage to selvage, not on the bias. 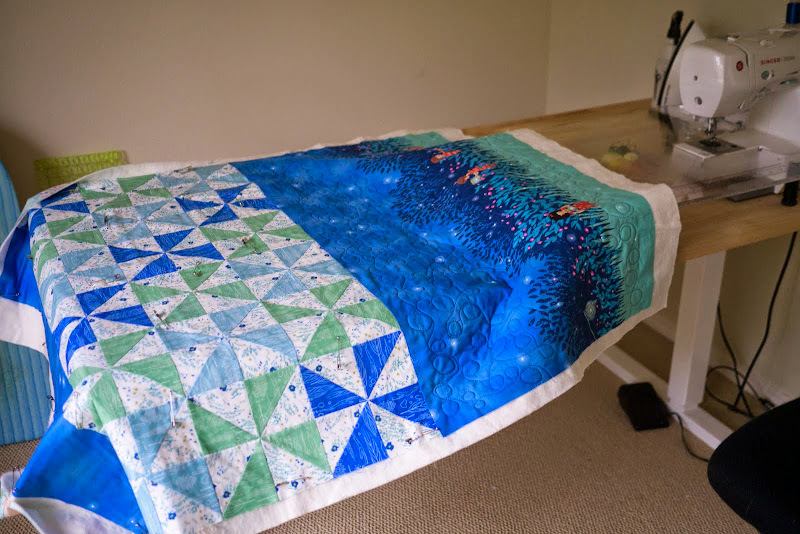 This entry was posted in Crafts, Quilting on November 28, 2014 by admin. I will never forget Ferguson. I spent about 20 minutes of my 90 minute labor listening to coverage outside the birth center. I would like to know why it took a concern about discrimination for an investigation to occur. Why is unjustified use of excessive force acceptable until it’s discriminatory? Excessive police force should never be OK.
Based on reading those, it seems to me that the officer was possibly or even probably justified in firing his gun while he and the youth were tussling in his vehicle. After all, Brown’s DNA was found on his gun. However, those were not the shots that were fatal. They didn’t even cause significant injury, if you read the articles above. Then Brown ran away, and the officer pursued him. Couldn’t he have waited for backup? Wouldn’t backup have allowed him to bring Brown in safely? Brown then moved toward the officer. I think it’s unjustified to kill him, but I can see why the officer felt he was in a dangerous situation. The key is that if he hadn’t exited the cruiser, Brown would likely have just run off and could have been apprehended later. Is there a good reason why he should have exited the vehicle and pursued? No matter how you slice it, the matter seems far from cut and dried. The NYT article brings up a number of differences between the way this grand jury proceeded and the way they typically proceed. This seems odd to me. An officer has to have malice or willfully bad intent to be convicted, she wrote. It’s an incredibly high bar. “Accident, mistake, fear, negligence or bad judgment is not sufficient,” Durkan wrote when declining to charge Birk. The Seattle case was completely clear, in my opinion. The behavior of the officer was absolutely unnecessary and unacceptable. Everyone agreed. And yet – no indictment. The Missouri case is far less clear, so of course there is no indictment. There’s a fantastic article in the Seattle Times describing an additional two other cases here in which police violence resulted in loss of life or severe injury. Basically, the police can do whatever they please. I grant you, at long last, there was a DOJ investigation, as I linked at the top. But again, the investigation was only called based on concerns about discrimination. Fortunately, whatever, the reason, it seems likely there will be some changes in the department. But until there are consequences for going around and shooting people, I can’t see there being real change. In Ireland and the UK, most police do not carry firearms. I don’t want to go on at length about the pros and cons of this, but it seems to me that in general, we have way to many guns in this country. Isn’t it ironic that the only life-threatening risk Brown posed to the officer was because of the officer’s own gun? This entry was posted in News on November 26, 2014 by admin. I’m in the process of hand-sewing the binding to the back of quilt number three. If I were to do this again, I’d use a lighter colored thread on the bottom section. I used a blue that matched the blue on the bottom and the top, and it showed up way too darkly on the green and on the back. If I could go back in time, I’d use a lighter blue. I discovered that light thread on dark fabric doesn’t show up nearly as well as dark thread on light fabric. I used a lighter colored thread on the pinwheels, and I liked the effect a lot more. Because this quilt is intended for a Texas recipient, I used Quilter’s Dream Orient rather than wool batting. It is so much easier to work with! I miss that lovely wooly smell and the lovely loft of the wool batting, but wow, it’s like night and day. 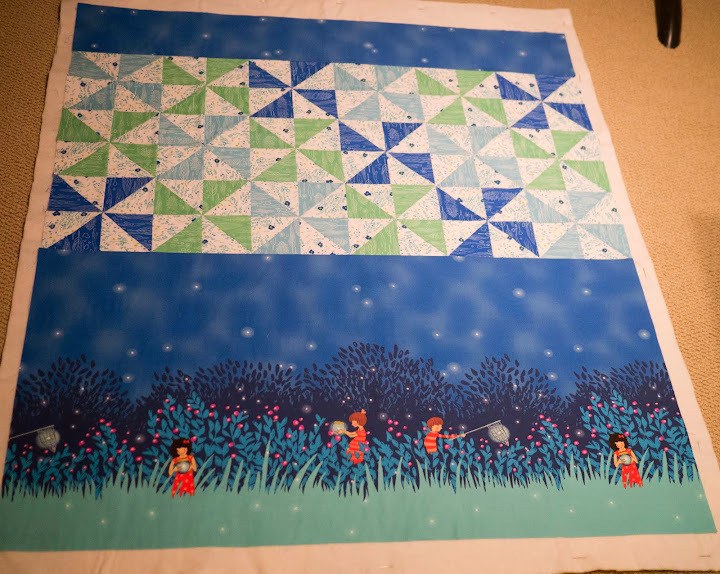 Nevertheless, quilting is still by far the hardest part of the project for me. I do feel like I’m gaining some proficiency versus when I started, but it’s still an exercise in hunched shoulders, gritted teeth, and a finished product that does not look like what I see in my mind’s eye. 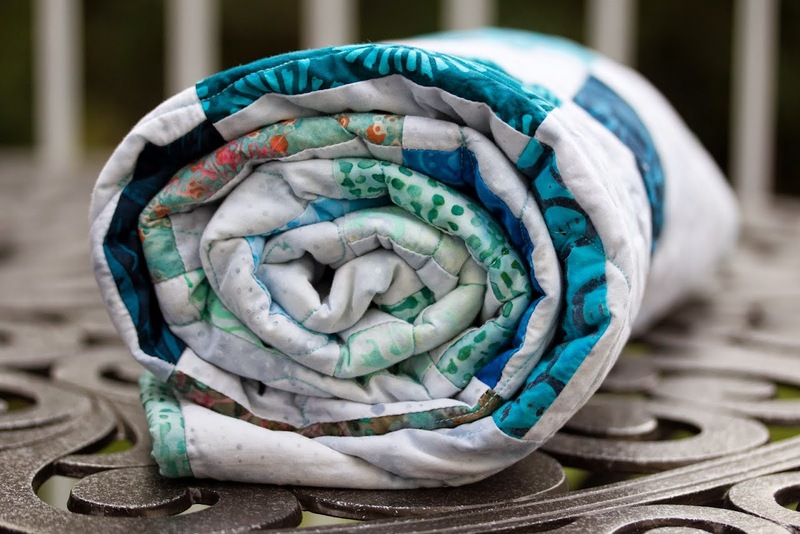 This time, I again did some practice runs on smaller quilt sandwiches, but it becomes so much harder when I’m trying to move the entire quilt around. 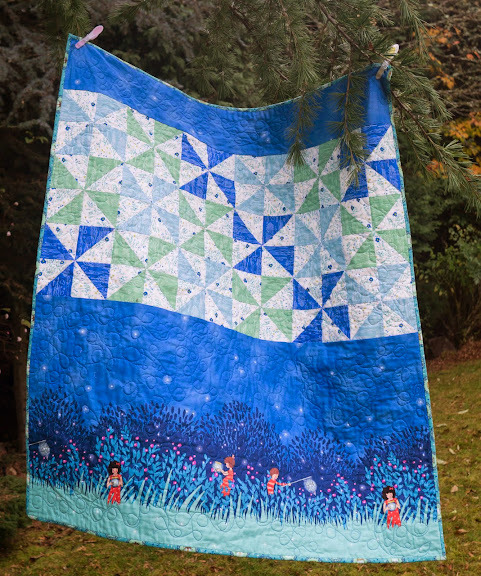 This entry was posted in Crafts, Quilting on November 26, 2014 by admin. Late night Gilmore Girls has made me reminisce about my Europe trip. 11 weeks. $1200 or thereabouts. 22 years old. A 30 pound pack with the bare essentials. I was in such amazing shape by the end of the summer after hauling that thing around! Limerick, the Aran Islands, Dingle, Dunquin, Castlegregory, other points in Kerry , Dublin, Castledermot, Dinan, Cap Frehel, Rennes, Bourdeaux, Nimes, Arles, Avignon, Girona, Cuenca, Morella, Caceres, Trujillo, Arcos de la Ventura, Sevilla, Granada and Malaga. Will I ever do anything like that again? I hope so. But when? This entry was posted in My life, Travel on November 23, 2014 by admin. I finished sewing the binding onto Briony’s quilt yesterday and washed it this morning. 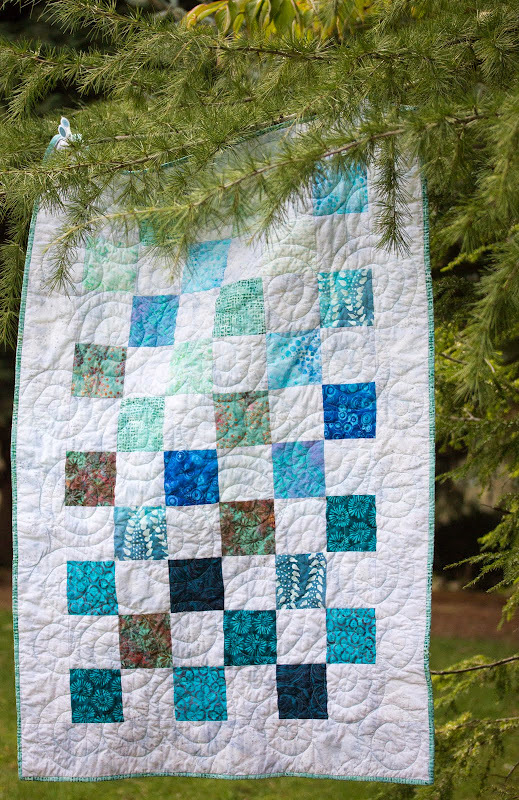 I read somewhere that a quilt always looks better after washing, and in this case, I concur. It also brought out that wonderful wooly smell. My spirals look wonky up close, but fine from a distance. Overall, I like the effect. I pieced together the backing using leftover fabric. 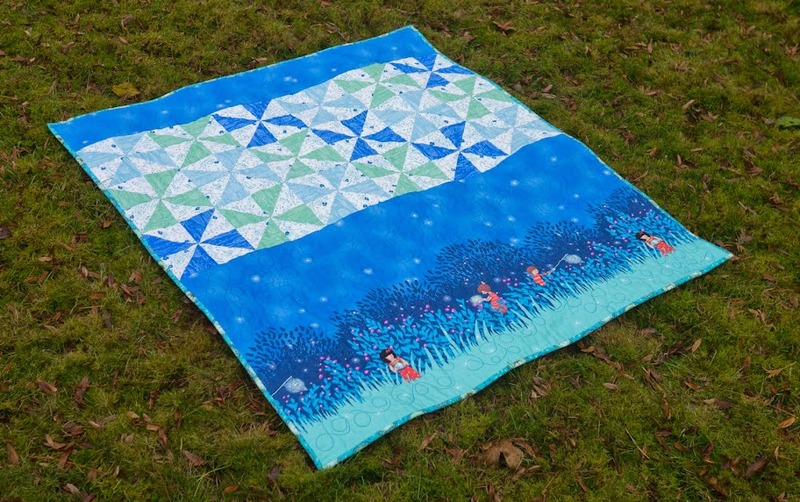 The quilt is 36 x 54″, perfect crib size for Briony. 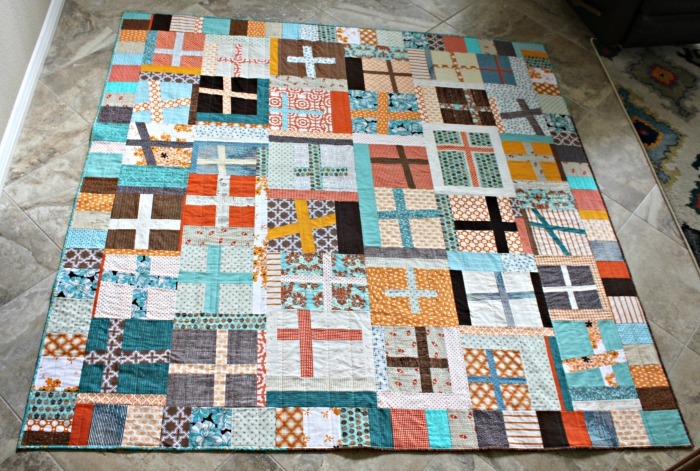 For piecing, I used Radiant Threads 40-weight thread. 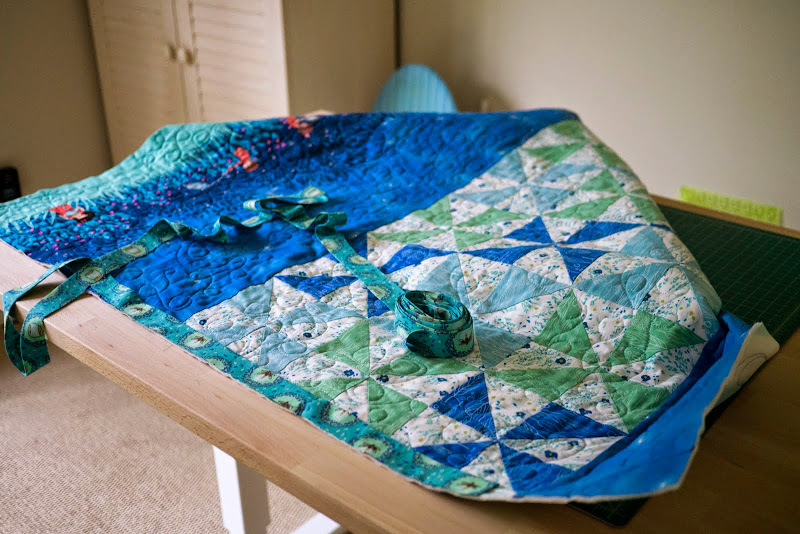 For quilting, I used Aurifil Mako 28-weight for the top thread and Aurifil Mako 50-weight for the bobbin thread in 5006, Light Turquoise. I used my closed-toe darning foot. To sew on the binding, I used Aurufil Mako 50-weight in white. 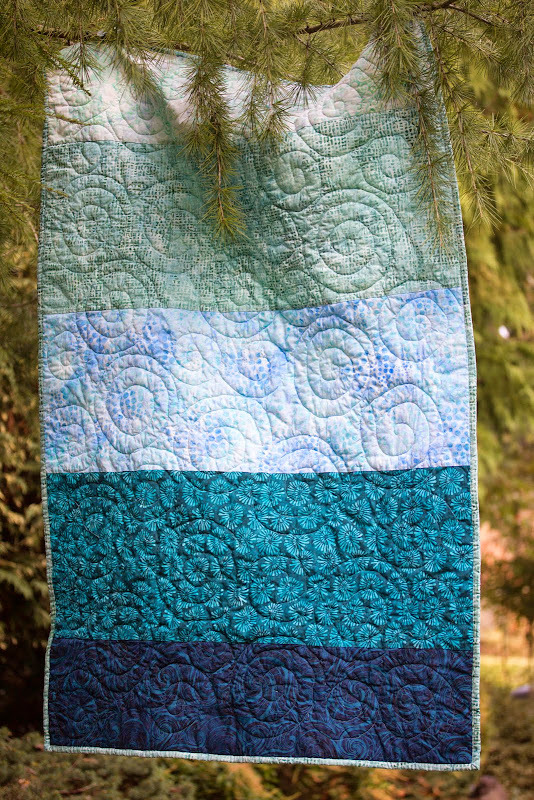 I hand-sewed the binding to the back of the quilt with Aurufil 28-weight in light turqoise. For batting, I used Quilter’s Dream 100% wool, which I absolutely loved. It has beautiful drape, and is light and fluffy and warm. Wonderful! The only downside was that the high loft made it a bit hard to work with. I’ll definitely use it again. This entry was posted in Crafts, Quilting on November 18, 2014 by admin. 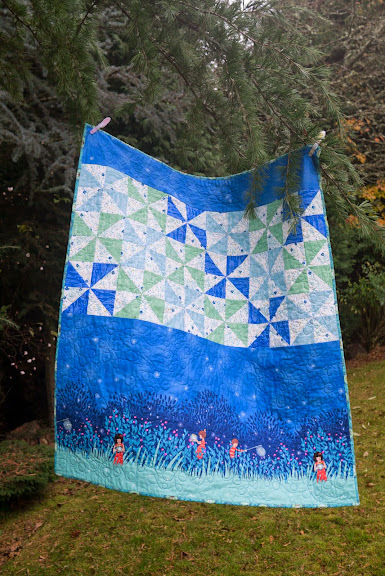 I’ve been interested in two types of quilts in my late night quilt wanderings lately. (B woke up every two to three hours last night, so I had plenty of chances to look.) 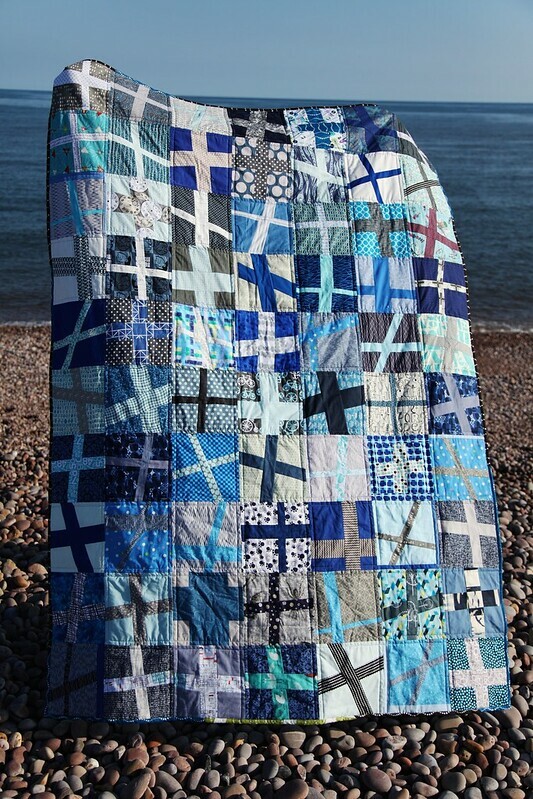 I’m looking at these quilts with an eye to something I might be able to make myself. There’s something about it which I think just makes it really stunning. The color, I suppose. Anyway, creating all those geese doesn’t look technically challenging to me, just a whole lot of work. 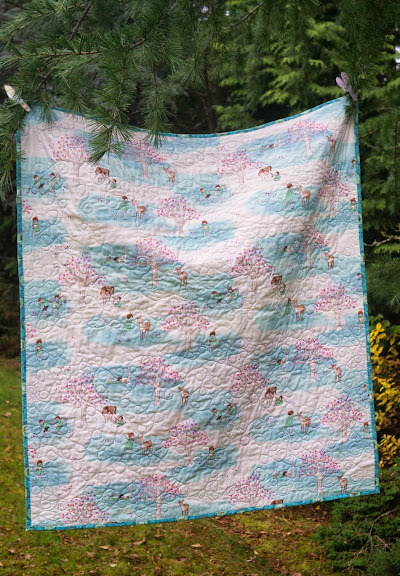 There are about 400 geese, each consisting of three pieces of fabric, on this quilt. Choosing colors is another matter – that would definitely be challenging. 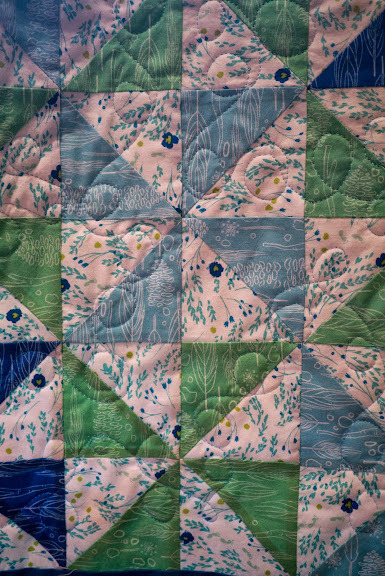 I think that is the hardest part of quilting, and maybe the most important part. 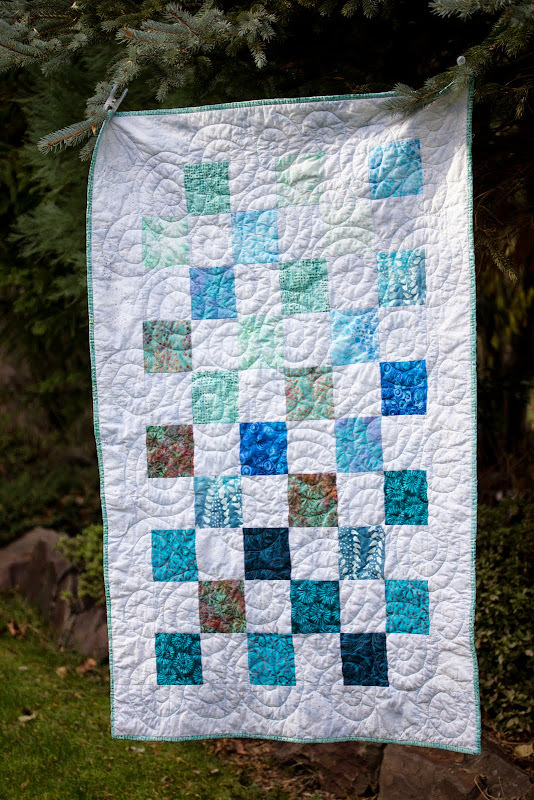 I would love to try and make a quilt like this, but I think it’s going to have to wait a few months or a year until I have a bit more time. 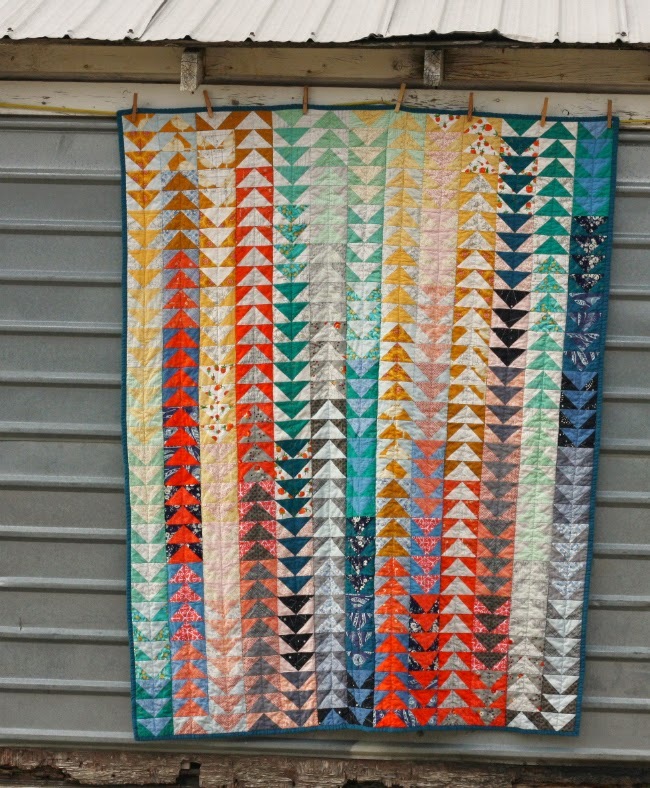 I think a quilt like this might be more realistic for me to attempt right now as opposed to the flying geese. I finally got the fabric I want to use for binding for my quilt for Briony in the mail, so I need to get to work on that. Hopefully, I’ll finish that in the next week or so. 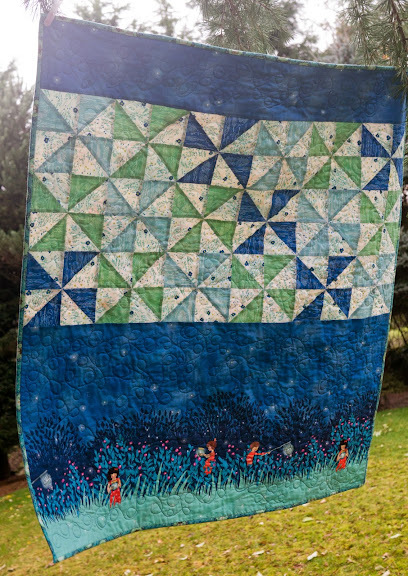 This entry was posted in Crafts, Quilting on November 15, 2014 by admin.